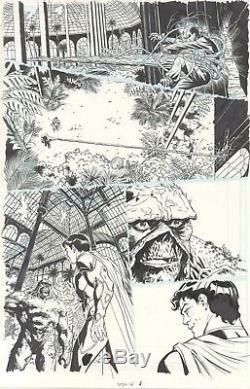 Great page with Swamp Thing and Superman from new 52 run when Charles Soule was writing the book. Kano did digital layouts and inked the page traditionally himself. All stages done by Kano himself and this is the only original art for this page. As with all original comic art, there may occasionally be small smudges or ink marks from being handled by the artist. The item "Swamp Thing original comic art page by Kano. Superman appears as well" is in sale since Monday, January 22, 2018. This item is in the category "Collectibles\Comics\Original Comic Art\Interior Pages". The seller is "joscrew" and is located in San Diego, California. This item can be shipped to United States.